Christmas day lunch cupcakes, babycakes, and cake – what a huge baking escapade! 1. Pre-heat oven to 180 deg C. Line muffin tin with paper cases. 2. Put all ingredients except for the milk in a bowl, food processor, or mixer. Mix until smooth. 3. Pulse the batter while pouring milk, until you get a smooth consistency. 4. Evenly divide batter into paper cases. Bake for 15-20 minutes. 5. Let stand for about 5 minutes, then cool on rack. I used the vanilla buttercream recipe from here. Now for the coconut babycakes, I used the same Nigella Lawson cupcake recipe, but substituted the vanilla extract with coconut extract (or 1 tbsp coconut essence) and added about 1/2 cup desiccated coconut. 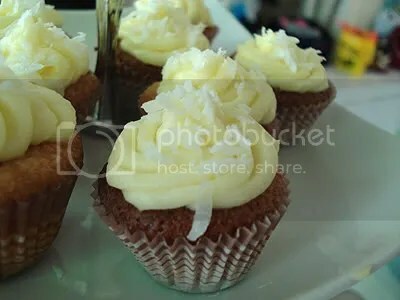 The lemon cream cheese frosting work very well with the babycakes – they actually tasted like coconut macaroons! Recipe for cream cheese frosting found here. I got the idea and the recipe from Couture Cupcakes. 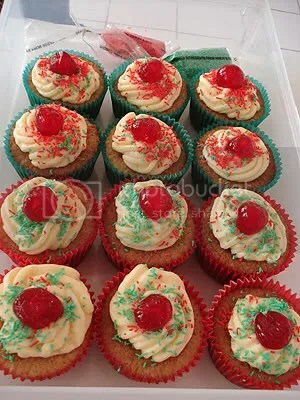 Hers were cupcakes, and while I wanted to keep the cupcakes uniformed throughout the party, I felt that a cake was calling out to me – so the adults can enjoy a nice slice of cake with tea or coffee while watching the kids play and eat their babycakes. Hehe. I dunno… just some OC stuff in my head I have to follow. I used a normal lemon cream cheese frosting again for this, to echo the zesty citrus flavours of the cake. 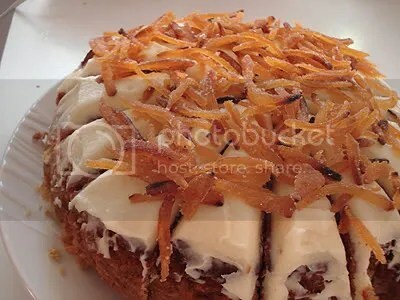 And I topped the cake with some candied orange peel that I read about here. They were a perfect combination!!! Pre-heat oven to 180 deg C. Line muffin tray with paper cases, or a round 8″ springform cake tin with greaseproof paper. In a large bowl, put orange pulp (or juice), carrots, eggs, buttermilk, vanilla extract, brown sugar, orange zest, and vegetable oil together. Whisk together until combined. In another bowl, mix flour, baking powder, bi-carb soda, salt, and chamomile tea. Fold in flour mixture to the carrot batter, in 2 batches. Evenly divide batter into muffin tray or cake tin. Bake for 20-23 minutes for the cupcakes, 35-40 minutes for the cake (or until skewer inserted in the middle comes out clean). Let stand for about 5 minutes before removing from tin. Cool and frost with frosting. Peel the oranges then cut into very skinny julienne pieces. Soak the orange peel in 1 cup of water and salt. Let stand overnight. Drain and rinse the orange peel. In a saucepan, boil the orange peel with 1 cup of water, then drain. Repeat the process 3 times to remove the bitterness of the skins. Back to the saucepan again, and boil the orange peel with 1 cup of water and 1 cup of white sugar. Let the sugar melt and dissolve in the water, and remove from heat just as soon as the water has evaporated and the sugar has turned into a sticky glaze over the peel. Note be mindful of the saucepan because at this stage the oranges will burn in a matter of seconds if left on the heat for too long because the sugar burns easily. Roll glazed orange peel on castor sugar. Refrigerate for about 1 hour so they harden, and use as topping on cakes or cupcakes.